1. Bag of tricks. This one has never failed me. A few weeks before the flight, I browse Amazon for new small toys and activities and put them in an opaque bag (these are great) that fits into my diaper bag. The boys love digging through it and discovering something new every hour (or few minutes, haha). Other favorites I bring are stickers (hours of fun, if not a bit annoying to tidy up), a few new lightweight books, and snacks (obviously). 2. Get organized. 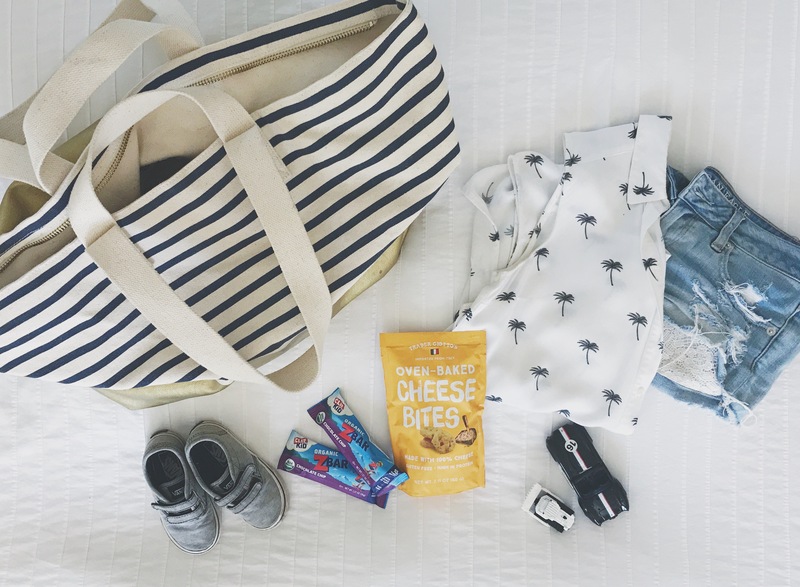 On the subject of bags, I’ve found it really helpful to organize every single item in my carry on / diaper bag into its own smaller, categorized bag – a change of clothes in one, snacks in another, etc. It helps me stay sane and allows me to grab what I need at one glance instead of rifling through everything. I’ll often just use clear, gallon-size plastic bags so I can easily see what’s in them. They can also serve as wet bags for any unforeseen / inevitable accidents. 3. More is not more. It’s taken me years to become a more efficient and minimal packer (and there’s still much room for improvement!). But now having to pack for two kids as well as myself, I really have to resist the instinct to overpack. It can be tempting to bring every single thing we might possibly need, but I have regretted overpacking way more often than I have regretted not bringing any particular item, or extra pair of whatever. 4. Schedule flights around naps (if possible). This one hasn’t always gone in my favor, but scheduling flights in the late morning / midday sometimes means my little ones are able to pass out at some point on a long flight. The older they get the less often this happens, but it’s always a nice break when it does! 5. Direct vs. layovers. Does your little one do better with a break to stretch her legs and run around for a while? Then a layover might be best for you. Personally, I’d rather deal with one longer flight than managing the stress of boarding, deplaning, boarding again and possibly missing a connecting flight. Taking the time to think about your babe’s development stage and unique personality can help you make the best travel plans possible. 6. Take a deep breath and relax. I used to stress to the max about flying with my little ones – I was so terrified of annoying people. But in the last 3 years, I’ve never had anyone be rude to me (I think people mostly feel sorry for me, haha!). Fellow travelers are most likely to be kind and understanding, and will probably even offer to carry something for you! So give yourself some grace. We are heading back to California later today, so wish us luck on our cross-country flight! Do you have any fool-proof tips for traveling with kids? I’d love to hear them!